I have seen, at times, your paper has made it to different parts of the world, proven by a simple photo of one of your readers casually glancing at an issue during their travels. I always thought it interesting and certainly amusing that someone would schlepp a copy around with the hopes of getting “the shot” in some faraway place. Well, add me to your list of schleppers. My wife, Jennifer, and I recently travelled to Cuba (not altogether legally) for a week or so of celebrating our anniversary as we do every 4th of July week, ever since getting married at our home in Rocky Point four years ago. A trip, mind you, that almost didn’t happen as we have both been busy and were considering foregoing our July trip this year. But, with a simple nudge from Jennifer’s parents Tom & Nancy, we started our planning on Father’s Day evening at their home in Prescott, and ten days later we had secured our flights and were off to the airport. Circumventing the State Department’s requirements for legal travel to Cuba, we avoided the traditional red tape of visa requirements for one of the officially sanctioned reasons such as educational, religious, humanitarian etc., and booked our non-connecting flights in and out of Cancun and into Havana as many American’s have been doing for years. It worked, and after successfully landing in Havana, we passed the tripod mounted security cameras in the arrivals hall, (clearly a holdover intimidation tactic from year’s past) as well as other intimidating men and women dressed in military attire. But, getting through immigration and into baggage claim was easy and we found most everyone to be friendly and readily accepting of Americans. While spending time in Havana I found a “stowaway” in my backpack, a copy of the June Issue from our trip down to Rocky Point for Circus Mexicus. A brilliant thought sprang forth (second in my life, marrying wife was first) as I remembered others who had taken the photo with your paper, and I asked Jennifer to humor me and snap a pic of me on the famous Havana Malecon with our favorite little paper that is always on our coffee table in Las Conchas. Doing her best to not make me look like a gargoyle, which is no easy task, she managed to get the photo as planned. However, knowing my limited appeal I thought it best to try and capture one together, a la selfie mode, and think the addition of Jennifer in the shot clearly is the photo that people would want to see. 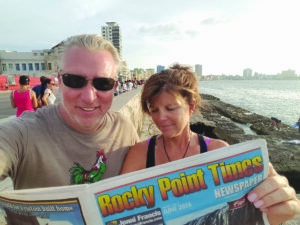 It seemed somewhat appropriate that the Havana Malecon should be the spot with the photo as Rocky Point’s Malecon is one of our favorite places in the world. So, thank you for continuously putting out such a great paper that always seems to provide us with interesting stories, great pics, info on events and yes, at times a photo of one of your readers shamelessly hamming away for the camera. I hope you enjoy our pics.